This article is a step-by-step guide to enabling Japanese input (hiragana, katakana, and kanji) in Ubuntu. If you've ever seen the great way Mac OS X's built-in international input system magically transforms typed romaji to kana on-the-fly and wished you could do the same thing in Linux, you're in luck, thanks to a pair of great utilities: IBus and Anthy. 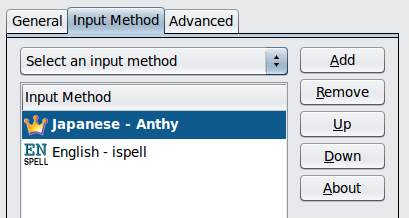 Once you install and configure IBus and Anthy, you can easily flip back and forth between English and Japanese input. It's great. Let's get started. Applies to Ubuntu, Karmic Koala. Does not cover installing fonts. Step one: Avoid SCIM -- You may find, as you Google around, many references to SCIM. Ignore them. SCIM seems to have some issues in Karmic. For me, SCIM would run, but it would not actually... you know... work. Step four: Activate your environment variables -- Log out and log back in, or simply source your ~/.bashrc (or equiv). Note that I've moved Anthy to the top of the list. You'll want to do the same. Step seven: Trigger IBus -- Launch an app you'd like to type into and use the default trigger (ctrl-space) to start IBus. (Or use whatever custom trigger you defined during set up.) Notice that the little IBus floating window thingy appears somewhere on your screen. The screenshot below shows the floating window with the Anthy kana/kanji selector activated. Step eight: Try it out! -- Start typing romaji. 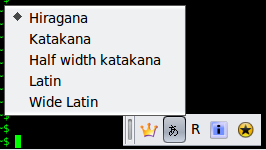 Note how IBus-Anthy magically transforms your romaji into hirigana (or whatever you have selected in the kana/kanji selector). Pretty cool, eh? Step nine: Turn it off -- The trigger (ctrl-space) toggles IBus on and off. Step ten: Make IBus start when you log in -- There are several ways of accomplishing this, but one (slightly kludgey way) is to simply add 'ibus-daemon &' (without the quotes, obviously) to your ~/.bashrc (or equiv). You'll want to test this before logging out by sourcing your .bashrc, like so: source ~/.bashrc -- If you get a prompt back after running that source command, and if IBus is running, you're good! If you prefer to start IBus manually, simply type ibus-daemon& from a shell prompt whenever you want it running. The next natural step is to make the Japanese fonts look good. I'm out of time for now, but once I tackle the Japanese fonts fixin', I'll post my findings here. If you have questions or comments, drop me an email message. Thanks. Lately, I've been using Ubuntu about fifty percent of the time throughout my workday. I used to use Linux 100% of the time (Slackware or Debian), but for the last few years I've been using Mac OS X 100% of the time. Making the switch from Linux to Mac OS X was largely snag-free, but I did have to spend a fair amount of time finding applications in Mac OS X that performed all the functionality I was used to in Linux. Now, that I'm using Linux again, at least half-time, I find I'm having to go through the same exercise of finding apps and utilities that do what I need. Mostly, this has been very easy. One exception has been annoying because it's something that's so trivial, one would assume it'd be easy to take care of right off the bat. Namely, I need a simple "tea timer" utility. You know... you tell it how many minutes to count, and when that many minutes has passed, it makes an obnoxious sound. I've looked around a few times now for such a beastie. There are a couple of things that are pretty close, but nothing that exactly fits the (simple) bill. Today, annoyed by the absence of a tea timer again (I use timers all the time for various reasons -- the major one right now being that I have to enforce typing breaks because I have a slipped disc and if I type like a fiend for hours on end, I end up in a lot of pain), I decided to just hack one out in Perl. This was definitely a case of "Perl to the rescue." It took a couple of minutes to make a script that did exactly what I want -- much less time than I've spent scouring the 'net for a utility to do the same thing. Plus, since it uses mpg123 to play the alarm, I can use any sound I like, as long as mpg123 can play it. I ended up making a little series of chimes in Garageband for the alarm. Works great.